The 2014 FIFA World Cup in Brazil is now a thing of the past and Germany has come out on top. While we await FIFA's official World Cup XI, our journalists have put together their SL Team of the Tournament. With 171 goals scored, the Brazil World Cup equalled the record for most goals scored at football's biggest stage from France in 1998, and for the third time in a row, a European nation has taken the trophy (the first time ever on South American soil). Germany won their fourth World Cup title after the stunning extra-time winner by Mario Gotze and that's why it doesn't surprise much that we selected four players of their starting XI and named Joachim Low as our coach of the tournament. We disagree with FIFA and have selected Thomas Muller as our Player of the Tournament, while Arjen Robben and James Rodriguez finished in second and third place. The team was set up in 4-3-3 formation and has been selected by our team of respected journalists. 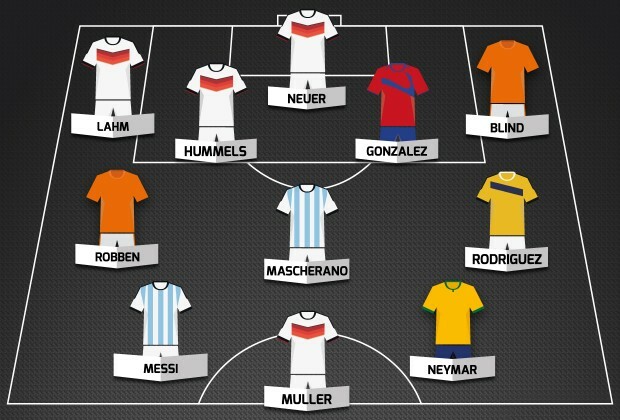 Here's our 'Team of the 2014 World Cup', do you agree with us?